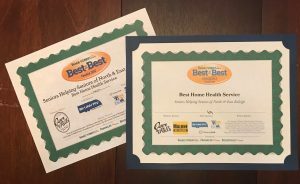 Seniors Helping Seniors® of North & East Raleigh was very honored and humbled to be recognized as a finalist for Best Home Health Service in the 2018 Wake Weekly Best of the Best reader’s choice contest. This is a regional competition held by The Wake Weekly which each year recognizes the very best of area businesses, services, schools and more. The Wake Weekly has been a part of the local business scene since 1947 and this contest emphasizes how important local businesses are to the community. The Best of the Best not only shines a spotlight on excellent community businesses, but it allows newcomers a chance to discover establishments that the locals have already deemed worthy of recognition. It is our caregivers’ hard work, compassion and energy which is the difference that once again made us one of the “Best of the Best”. If you or a loved one live in Raleigh or Eastern North Carolina, you can experience it for yourself. From Raleigh to Wilson, Franklinton to Clayton, Wake Forest to Smithfield, and all points in between we can help. Contact us today at 919-761-5346 to get started! Tips for Caring for Older Adults with Hepatitis C What Happens at the Hospital After a Stroke?